With less than three weeks to go until the start of the BVI Spring Regatta and Sailing Festival, teams from several countries including Germany, The Netherlands, UK, Canada and USA will join local sailors at one of the most popular and friendly regattas in the Caribbean. The international fleet will be hosted by Nanny Cay Resort and Marina on the idyllic island of Tortola and is home to the yachts during the week and where the sand-between-the-toes partying takes place at the Regatta Village each night. The regatta attracts an eclectic mix of boats and crews, from first timers to regular racers and top professional teams too. 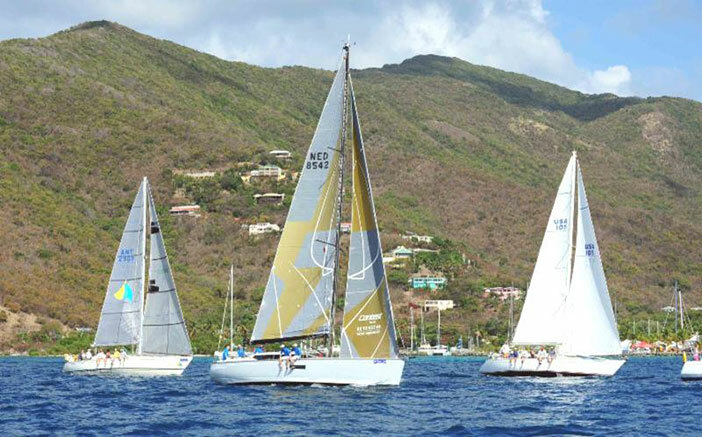 Friday 3 April to Sunday 5 April sees three days of world-class racing action in the BVI Spring Regatta, but is preceded by the four-day Sailing Festival where teams will vie to break the record for the Nanny Cay Cup in the Round Tortola Race. New this year is the Veuve Clicquot Island Invitational, a pursuit race to neighbouring Jost van Dyke, home of the world famous Foxy’s Bar, where teams will be welcomed with beach games, BBQ and the music legend of the island, Foxy himself. The lay day is a day to celebrate the maritime heritage of the British Virgin Islands with 100-year old Tortola sloops racing the VP Bank Tortola Sloop Challenge. That afternoon, registration opens for the BVI Spring Regatta with the traditional Mount Gay Rum Welcome Party. Stefan Jentzsch’s all-carbon Germany flyer, the Carkeek 47, Black Pearl made its debut in the Rolex Middle Sea Race in October 2014 and recently competed in the RORC Caribbean 600. The BVI Spring Regatta is the third event for the boat whose core crew of international professional sailors includes high-profile, South African America’s Cup navigator, Marc Lagesse. “The crew is looking forward to this event as a fun addition to Black Pearl’s race calendar,” says Jentzch, the German owner who is a passionate sailor. Big Trouble, a Melges 32 is owned by Tom Elsen (Chicago), Paul Latour (Nashville) and Paul Quast (Minneapolis) whose home port is St Croix Yacht Club, USVI. They will be racing to help promote the Melges 32 class in the Caribbean and this will be their first season. “We are a Corinthian boat in a great, hugely competitive international fleet. This is our first season, both on the Melges 32 and racing it in the Caribbean. We are attracted to the regatta because of the warm weather, warm water and have a great boat, so look forward to racing with great competitors. My aim is to keep the rig and the crew out of the water as much as possible,” jokes Elsen. How many teenagers can you fit into a Grand Soleil 56? 12 to be precise! That’s the number of young sailors racing on board Shine, Giles Redpath’s British entry, racing with three families and a group of friends brought together for this year’s regatta. A member of the prestigious Royal Ocean Racing Club and Royal Thames Yacht Club and CEO of a solar farm development company, his boat was bought in 2013 and appropriately named Shine. He has many years of racing and cruising behind him, but this will be the first time at the Spring Regatta. 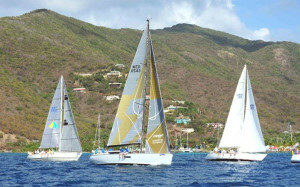 The BVI Spring Regatta & Sailing Festival starts on March 30 to April 05. All the latest news, images and video can be found on the BVI Spring Regatta web site.